This one's pretty beautiful, methinks. I vaguely remember seeing a photo of a similarly-style Jewel at some point, but I'm not 100% certain. Could just be a very nice independent or some other chain. Ideas welcome. Groceteria wrote: This one's pretty beautiful, methinks. I vaguely remember seeing a photo of a similarly-style Jewel at some point, but I'm not 100% certain. Could just be a very nice independent or some other chain. Ideas welcome. Indeed, but Kohl's was only in Wisconsin, I think -- and they even had a fairly limited range there. National had a few stores with rounded roofs in later years. I don't think I've seen Jewels like this. Other possibilities worth raising (don't know if they ever had these designs): Hillman's (long gone chain that was upscale/downscale in an odd collection of locations) or Red Owl, which had some stores in the Chicago area. There's a similar building on Dempster St. in Morton Grove and I could of sworn the lines going un and down were painted different colors. Nope, it was definately a Kohl's according to Chicago Tribune archives. LadyNoir wrote: Nope, it was definately a Kohl's according to Chicago Tribune archives. Interesting. I had no idea Kohl's ever ventured south of Milwaukee. Thanks a bunch and welcome aboard. The board is a little light on midwest history, so we'll look forward to hearing more. Groceteria wrote: Interesting. I had no idea Kohl's ever ventured south of Milwaukee. Heh, heh. I had no idea Kohl's had food stores until about two years ago. Privelage of working in a library. How I found out was by chance. 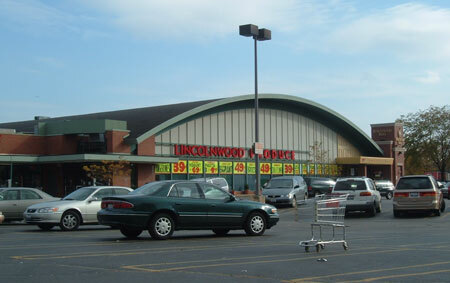 Around 2000 or so my parents used to frequent the Lincolnwood Produce place and I was curious as to its past because I currently live not too far from there. Just punched in the address at work and up came ads for Kohl's foods and the same goes for the one that was on Toughy and Rockwell. I had been curious about that old Kohl's/Butera as well especially when I was a kid and it sat abadoned there for a long long time. My father managed an apartment building around the corner and he used to contend with people who would take old carts from the place and use them by hiding them in the back stairwell. He suspected that they came from the old Butera because I think it had the Butera lettering on them. Too young to be knowledgable enough to (gasp) realize what a gem I had and take photos. LadyNoir wrote: Heh, heh. I had no idea Kohl's had food stores until about two years ago. Privelage of working in a library. They weren't directly cconnected to the department store chain, although I think the two families were related back down the line somewhere, sort of like Lowes Foods and Lowes Home Improvement, both founded in northwestern NC. Funny I thought I had read that the two (Kohl's Department Store and Kohl's Foods) were related or maybe I was just assuming they were connected and one and the same. I was reading an article some time ago about I believe the daughter of the Kohl's family patriarch and I think that is where I read about the connection. I have to relook at that. She also started the Kohl's Children's Museum which was in Wilmette but is now in Glenview. The family were big on philanthropy. I remember when I was younger my family shopping a few times at Eagle Food Centers. The one we went to was very distinctive on the outside, a semi-elliptical facade with a roof supported inside by full length steel trusses with all the lighting suspended from the roof. From what I can remember from memory, the facade was split horizontally down the middle with windows below and striped (blue and red?) panels above. Talking to my Dad, I figured out where at least 5 of these interestingly designed stores were. He also thinks that they were originally Kohls Food Centers, but can't remember for certain. I found a picture of the design on the net and it is attached below. In the picture, the store is now a K-Mart (location unknown) and has its windows panelled over. Later on, all the Eagles in Chicago closed and many were converted into Dominick's stores. Anyone remember Kohls, Eagle, or this store design? dtb305 wrote: Anyone remember Kohls, Eagle, or this store design? The example you provided (the Kmart in NJ) is very similar to a Kohl's prototype, and there were apparently some stores of this design in Chicago per another thread on this board. The actual Kmart pictured was almost certainly not a Kohl's, though, since that chain never extended to the New Jersey area, but it is very similar. I'm going to go ahead and merge these two threads. LadyNoir wrote: Funny I thought I had read that the two (Kohl's Department Store and Kohl's Foods) were related or maybe I was just assuming they were connected and one and the same. According to Wikipedia, they were. BATUS bought the Kohl company in 1972, and spun off the supermarkets to A&P in 1983.